Denna produkt ger dig 1860 bonuspoäng. Ellok klass 115 typ DB AG, loket har drivning på båda axlarna, LED belysning, ljusväxling, längd över buffertar 76 mm, epok VI. Model: The locomotive is an Era VI version with Klatte vents and rectangular engine room windows. The selector screw for catenary operation is located inside the locomotive body. The locomotive has enlarged buffer plates. Both trucks powered. The triple headlights are warm white LEDs that change over with the direction of travel. The wheel treads are dark nickel-plated. Length over the buffers 76 mm / 3'. 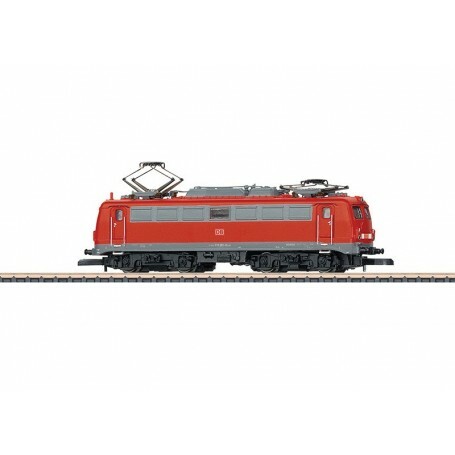 Prototype: German Railroad, Inc. (DB AG) class 115 electric locomotive painted and lettered for Era VI.